Join millions of other travellers who use Skyscanner to search, compare and book cheap flights, hotels and car hire, anytime, anywhere. Independent, unbiased and completely free, we simply find you the best deals out there in seconds. Book your next trip with the award-winning, easy to use app brought to you by the world’s travel search engine. Available in over 30 languages. 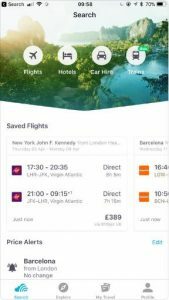 You no longer have to scour multiple sites for cheap flights, Skyscanner brings all your flight options into one easy to use app. Use our colour-coded calendar and chart views help you find the cheapest month and date to fly, and then select the best flight for you from providers such as British Airways, Ryanair, Easyjet, Flybe, Monarch, Emirates and hundreds more. Search and book train tickets across the UK with ease. We won’t charge you a penny more than the ticket price. Including rail cards and advanced, peak and off-peak tickets. Compare great hotel deals from thousands of hotels, resorts, apartments and hostels across the world. Find cheap hotel rooms near your current location to grab yourself a last minute hotel deal. Search the world’s car rental companies in seconds. Choose from airport or city locations to pick up your car, and then filter your results by vehicle type, fuel type and features to make sure you find the car you want at the right price. Tap into the Explore button to discover cheap flights to all destinations including our Top Deals popular destinations, last minute flights, and weekend breaks. Never miss out on a good flight deal again thanks to our helpful price alerts. Simply search for a flight you like (with a price you might not like!) tap the bell icon, and we’ll drop you a notification if the price changes. When you search, compare and book with Skyscanner there are no booking fees or hidden charges – just the best prices. Arabic, Danish, German, Greek, Spanish, Finnish, Indonesian, Italian, Japanese, Korean, Malaysian, Norwegian, Dutch, Polish, Portuguese, Romanian, Russian, Thai, Ukrainian, Turkish, Vietnamese and Chinese.